It doesn't take much for people to explode with outrage these days. Just like they did over Beyonce's video for her new song "Formation." That, coupled with her Super Bowl performance of it, provoked white people everywhere to decry Beyonce's referencing of black history and culture like the Black Panthers, along with alluding to acts of police brutality. How dare a black American artist pay dues to the people and events that shaped and influenced her, and speak about contemporary political and social issues. HOW DARE SHE! That was the general reaction from certain people, and it's a pretty dumb reaction. Why the heck wouldn't she do that? 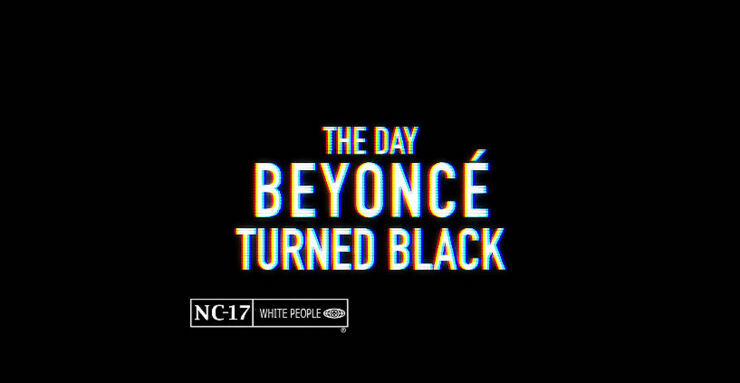 Saturday Night Live perfectly spoofed that outrage in their very funny and totally on the money sketch "The Day Beyoncé Turned Black." In the form of a mock trailer it plays on tropes from disaster movies and the horror genre to show panicked white folks losing their damn minds at the sudden realisation that Beyonce is black. "Maybe this song isn't for us?" someone muses. "But usually everything is!" shouts another. Zing. People then get increasingly hysterical as their worlds come crashing down around them at this epiphany that one of the most famous black singers on the planet is, well, black. Well played SNL, well played. The realisation sends middle class Americans into panic mode. Office workers are confronted with the fact Beyonce is black. White Americans can't take it. "It was the day they lost their damn white minds." And below is the music video and Super Bowl performance that caused such a stir.